For companies that don't have a marketing manager, we offer a special option allowing you to "outsource" your marketing to us for a monthly fee. This enables you to receive world-class sales & marketing services without adding a single dollar to your corporate overhead. It can be an attractive alternative to a full-time, salaried position. We provide highly experienced industrial marketing experts to work along side your leadership team. These professionals plan and implement projects that help you drive revenue from napkin to completion. 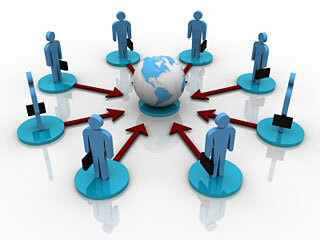 And, by outsourcing your sales & marketing function you only pay for marketing services on an as-needed basis. The fees are fixed and negotiated upfront, so there are no surprises. Low risk (you can end the engagement at any time with 30 days notice). You get an objective, outside perspective on your company, its products, its positioning and marketing strategy. When it comes to marketing, many industrial manufacturers think they need an in-house marketing department. This often means at least one marketing manager, someone to handle the website/ web marketing and some kind of support staff to maintain the CRM system. The costs for a basic in-house marketing department include salaries, payroll taxes, health insurance, time off for sick and vacation days and providing work space. Do the math. And, if there's a downturn in the business cycle, the company still has to pay the salaries and benefits until things get better or deal with the trauma of terminating employees. Alternatively, by using a firm like Pinpointe Marketing, you know exactly what you are paying for, and how much. There are no benefits or office space to provide, no support staff, and when slow seasons come around, a consultancy can be put on hold, or services cut back until they are needed again. While this option is not right for everyone, it can provide a cost effective way to cover your sales and marketing needs quickly and efficiently. If you'd like to learn more about this option, call our President, John R. Wirtz at 330-476-2423 for a free and private consultation.